Finally the Arcade Gacha is more accessible, the crowds have thinned and it’s a lot easier to shop. For the first anniversary of the Arcade Gacha I wanted to do something a bit different so I ventured into creating a fashion accessory instead of doing something pose-related. 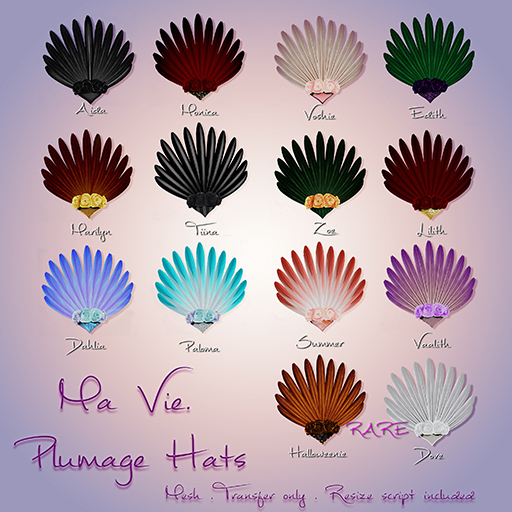 Plumage hat is 100% mesh, can be resized via script and it comes in 14 different variations, two of which rare. I hope you’ll love it as much as I did making it!